This pincushion doll has been designed as a special token of love for my dearest Alessia, daughter of Romina Petrucci, the creative owner of Romy’s Creations. This pincushion doll is full of colors and joy just as my wonderful friend’s daughter! I really enjoyed stitching it with the fabulous hand dyed threads from Romy’s Creations, over the wonderful linen from Fabric Flair. The doll is available from BrierRose under the name of Miss Scarlett and this pincushion doll has an embroidered overskirt, cross stitched with variegated hand dyed cotton flosses, finished with hand dyed trim from Romy’s Creations. A small round purse is decorated with a matching Deruta fuseruola bead over a gold tassel. 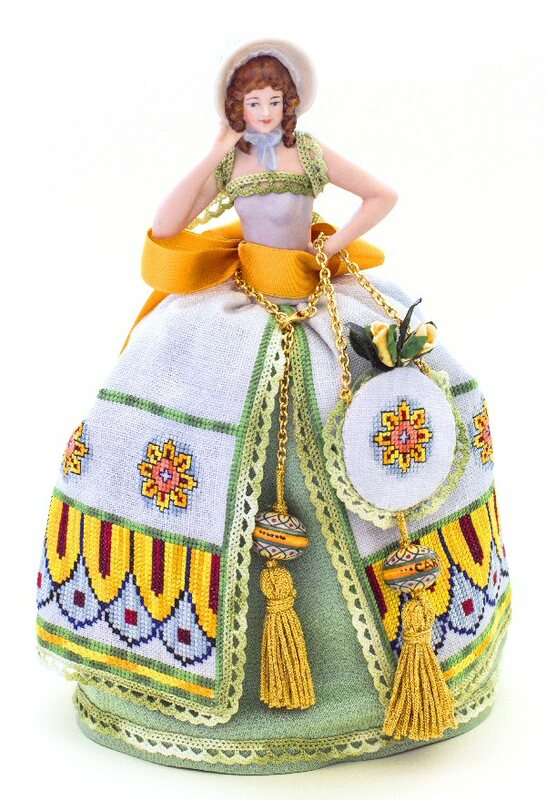 Another beaded tassel is hanging from the doll’s waist. These majolica beads are available from Giulia Punti Antichi.